I'm terrible when it comes to remembering birthdays. To correct this, I've put myself reminders in my address book and even tried using an application in Facebook. But it sill doesn't seem to work for me. This is why I think an application like Birthdaybook my just be the best solution. This free standalone application has solely one purpose: to store all important events and dates, such as birthdays and send you timely reminders. The program integrates perfectly with Address Book, to import all your contacts, and with iCal, to put them up onto your calendar. Birthdaybook also uses up fairly little memory and is quite discreet. It's regularly updated and only recently has changed to a much nicer Leopard friendly interface. You use it to browse all your contacts, alphabetically, by date or age. True, its purpose is pretty limited, but at least Birthdaybook will save you the hassle of entering birthdays one by one in your calendar. 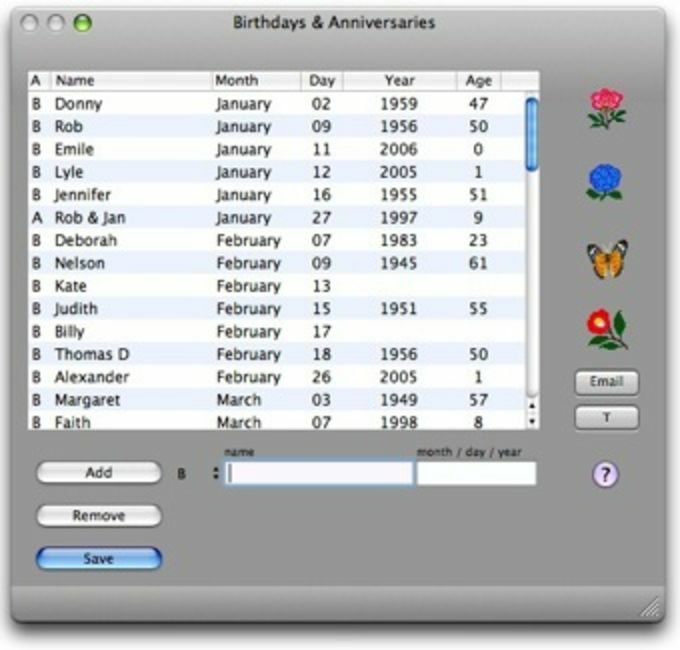 Birthdaybook is a popular "five star" program for storing and viewing all your birthdays, anniversaries, and other important events. It is used widely around the world and is translated in Dutch, French, Italian, German, and Spanish. What do you think about Birthdaybook? Do you recommend it? Why?